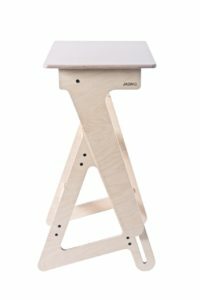 Looking for a beautiful, wooden, environmentally friendly standing desk that is strong and fits in to your life (and space) really well? Read this before buying a standing desk, you’ll want our expertise! 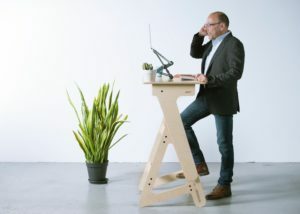 The Jaswig StandUp Nomad is a really cool standing desk. 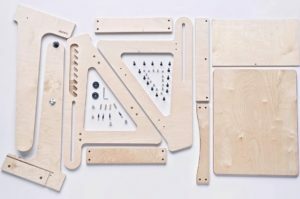 It adjusts to your height, has a decent amount of desktop space, is made with sustainable birch wood, and is a conversation starter. It is an excellent workstation for your laptop, notes, sketches, and designs. It also assembles easily. It’s primary drawback is the durability of the finish on the desktop… I was able to easily (accidentally) scratch it. All together though, this is a really awesome desk. The look of the desk is plain and I expect we’ll start to see pictures online of various ways people have customized the look of their Jaswig. To me it almost screams in its desire to be painted on or something. If you customize yours please send me a picture and I’ll include it here in the review. One note before I move on, I tested this desk for a week before writing this review and as a result, I removed the traditional desk in my home office. This is now my main workstation… that should give you an idea of how much I like it. The two best features of this desk are its look, and its underlying function. Everything from a pencil slot to an open shelf to store things is here. There is a notable cross piece that acts as a footrest as well. It is just really well done. The desk comes in pieces, packed amazingly flat, and goes together easily. Once it is assembled and you get the hang of adjusting the desk, you’re off and running. The finish on the desktop scratches too easily. The Jaswig arrives neatly packed in a box, which is heavy due to the strength of the materials. The instructions are very clear (as long as you follow them) and assembly takes around 10 minutes. The tools required for installation are included in the package. If you have ever assembled furniture before, maybe from IKEA, then you will feel right at home. Be aware that the finish on the wooden pieces is thin and so it is very important to assemble the desk on a carpet or blanket. Keep all the wooden pieces protected from scratches throughout assembly. Through real world use the desk will get scratched though there is no point in starting off on the wrong foot. I was excited to discover, once I’d setup the desk, that I could mount a monitor arm on it. 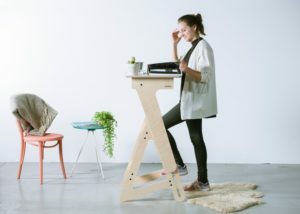 From a design standpoint there is enough space for a standard clamp-mount, the desktop is thick enough to handle it, and the desk is sturdy enough for the weight behind the center line. I highly doubt this is within the intended usage of the desk though, so proceed at your own risk as in all DIY projects. I used the LocTek Dual Monitor/Laptop Arm on mine, along with a large monitor and wireless keyboard and mouse. This let’s me keep the desktop space free for sketching, notes, or whatever while I use the desk. Once I installed the arm, the Jaswig Nomad quickly became my go-to workstation in the home office. Thank you to Mathias at Jaswig for providing this desk so that I could write a review based on actual experience with the desk!